Habitat for Humanity - Southwest Utah hasn't added a story. A number of brave Edgers will have the opportunity to rappel down Hyatt Place St. George, in exchange for donations back to the amazing local non-profit organization, HFH - Southwest Utah. Experience the once-in-a-lifetime opportunity to rappel down Hyatt Place St. George! Habitat for Humanity of Southwest Utah is a non profit building and repairing homes in Southern Utah. We are committed to providing safe, decent, affordable housing for qualified low-income families who would otherwise not be able to buy a home. Working with volunteers, families, corporations, congregations, and donors we are working to create a world where everyone has a decent place to live – starting right here in Washington County, Utah. HFHSWU was established in May 1998, for the purpose of building houses in partnership with low-income families in need of safe, decent, affordable housing. Our affiliate has completed 22 homes providing affordable housing for 125 individuals. We are currently working on our 23rd build here in Washington County, for the Havens Family! Sign up now,or make a donation! Habitat for Humanity - Southwest Utah hasn't posted any updates yet. 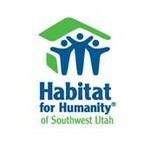 Habitat for Humanity - Southwest Utah is managing the funds for this campaign. Habitat for Humanity - Southwest Utah is a verified organization.